But that might not be the worst thing about Snap's capital structure. One of the most interesting aspects of Snap's (NYSE:SNAP) IPO filing is that the shares it's offering to the public will have no voting rights at all. As a result, co-founders Evan Spiegel and Bob Murphy will continue to control a combined 88.6% of the company -- 44.3% each. "Although other U.S.-based companies have publicly traded classes of non-voting stock, to our knowledge, no other company has completed an initial public offering of non-voting stock on a U.S. stock exchange," management wrote in its S-1 filing. Indeed, other companies have restructured their stock classes so that a founder-CEO can remain in control. Snap is just being more blunt about who's really running the show here. Most recently, Facebook (NASDAQ:FB) announced plans for a stock split so Mark Zuckerberg could maintain control of the company as he gives away most of his wealth to nonprofits and other causes. Alphabet (NASDAQ:GOOG) (NASDAQ:GOOGL) also restructured its shares in 2014 to keep its founders in control. Snap is setting things straight from the get-go. Individual investors will only be able to buy Class A shares at Snap's IPO. The share classes do convert. One share of Class C is convertible into one share of Class B. One share of class B is convertible into one share of Class A. (No, you can't convert shares the other way around.) As such, all shares of Snap stock, regardless of class, will participate equally in the profit of the company. Alphabet has the same voting structure for its stock, with the caveat that A shares have one vote, B shares have 10, and C shares have no vote. Facebook announced it would split its shares the same way at some point in the future. Shares of Alphabet provide the best look at how much investors value voting rights. Class A shares, which provide one vote, trade for a slight premium to the non-voting Class C shares. That premium is currently about 2.5%. 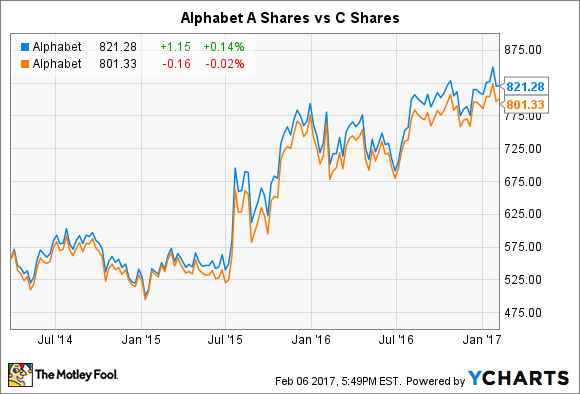 Alphabet A shares vs C shares. Source: Ycharts. So voting rights do represent some value to shareholders, or at least potential shareholders. Activist investors could buy up a significant portion of voting rights such that they can at least have some sway at shareholder meetings. With Snap's IPO, those shares won't be available to buy. Following the IPO, Evan Spiegel will receive an additional 3% of all shares outstanding paid out quarterly over the next three years as a bonus. Those will be Class C shares, and Spiegel will then be able to exercise complete control over the company. In the meantime, there's potential for deadlock votes between Spiegel and co-founder Bob Murphy, as they each control equal-sized stakes. But that's not the most concerning thing about the capital structure at Snap. The only way for the founders to lose control of the company is if they both die. As described in the S-1 filing, "Either of our co-founders' shares of Class C common stock will automatically convert into Class B common stock, on a one-to-one basis, nine months following his death." If that happens, the other co-founder will have a controlling share of the votes. In other words, both founders could leave the company but still be able to exercise control over it. Facebook made provisions to its stock split to ensure that Zuckerberg would only control the company's voting rights as long as he remained CEO. There's a provision on Alphabet's Class B shareholders that for every Class C non-voting share they sell, they must convert one Class B share into a Class A share, and presumably sell that as well. That makes it more difficult for the founders to retain complete control. In fact, their combined percentage of the shareholders' vote has fallen from 61% at the time of the stock split to about 57% today. Snap's structure makes it so that not only do individual investors have no voting rights, but the founders will continue to control the company until both of them die. That's putting a lot of trust in the founders, adding more risk to an already risky investment.